Hosted PBX and Business VoIP is the replacement technology for traditional business phone lines and PBX phone systems. The technology has been around for quite some time but was often limited by the quality of broadband connections available to SME businesses. Australian broadband infrastructure has undergone a major transition over the past few years. NBN has already rolled out fibre internet to over 3 million premises and is currently rolling out at a rate of around 200,000 premises per month. On top of NBN, major carriers and ISPs have also greatly improved their broadband infrastructure and business grade internet is now available to most businesses at very competitive rates. In most cases, broadband quality is no longer an obstacle to upgrading to a hosted virtual PBX system and business VoIP. But when choosing a broadband connection there are some considerations that have be taken into account. Hosted PBX uses 100Kbps, both upload and download, to make one continuous phone call without any interference. So the broadband connection must have that bandwidth available at any given time. So, if your requirement is to have ten (10) outside telephone lines, then there must be at least 1MB available in both upload and download capacity. Latency is the amount of time data takes to traverese the broadband network. Low latency is important to ensure there is no interference when making phone calls. Most business grade broadband services are low latency, but its important to double check. If the broadband connection is going to be shared with other internet usage, then your local network must be capable of prioritising telephone traffic. That's done using the QoS settings on the local router. So choosing a suitable router is essential. Most business ADSL2+ broadband connections have a maximum download speed of 20Mbps and an upload speed of 1Mbps. But that depends on the distance of the premises from the exchange and in reality these speeds are rarely, if ever, achieved. As a general rule, a business should expect a minimum download speed of 10Mbps and an upload speed of 600Kbps (0.6Mbps). 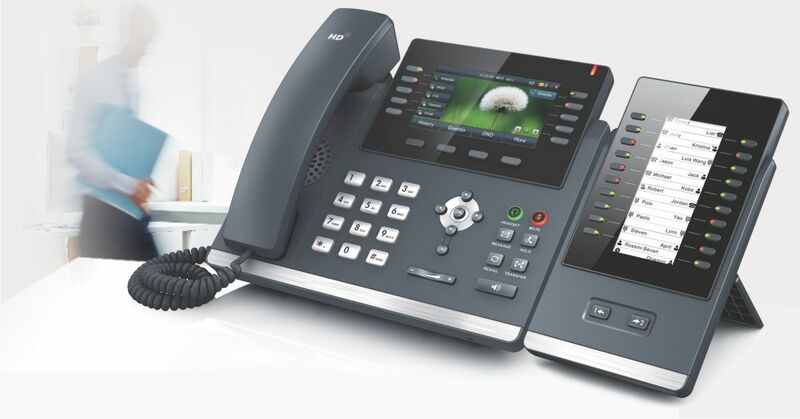 If used only for the hosted PBX system, the connection should carry six (6) continuous phone calls at any given time. However, if the service is being shared with other internet usage, it's not recommended for more than two (2) virtual PBX phone lines. When business fibre is not available, mid band ethernet and fixed wireless broadband are ideal for carrying both the virtual PBX and general internet usage on the same connection. Bandwidth can be allocated according to the business requirement and once installed there are no variations in both upload and download speeds, making it a very stable internet connection. Symmetrical speed means that both upload and download speeds are the same, making this type of broadband connection more than suitable for virtual PBX and business VoIP requirements. Sufficient bandwidth can be put aside (partitioned) to allow for the required number of PBX extensions and voice traffic. As a general rule, these type of broadband connections can comfortably accommodate up to thirty (30) outside telephone lines. Fibre is the ideal broadband connection for a hosted PBX system. It's not limited by any existing copper wiring, and offers extreme bandwidth and ultra-low latency. Business grade fibre has symmetrical speeds, both upload and download, and the bandwidth is generally only limited by the financial budget. Businesses with twenty (20) plus employees at the same location should consider fibre as the natural choice, especially if being used for both voice and data traffic. Businesses of all sizes can start experiencing the fantastic benefits of a hosted virtual PBX system and business VoIP. And generally they're no longer limited by their access to suitable broadband infrastructure. The transition process is really quite simple and in most cases only requires some simple upgrades.